"To nurture creativity, we have to resist defining the university narrowly," Emory President James Wagner explained in Creativity Conversation with Rosemary Magee, director of the Rose Library. Their wide-ranging discussion also included his own passions for photographing space, building clocks and restoring classic cars. The conversation began on a humble note that brought an appreciative chuckle from the audience. 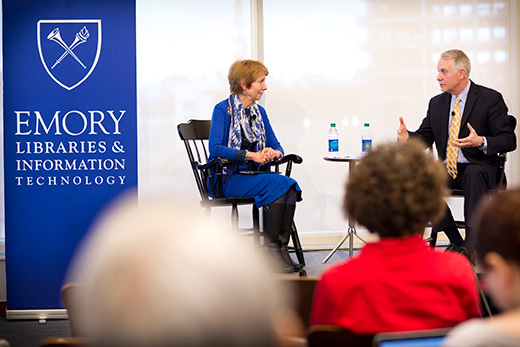 When Emory University President James Wagner sat down with Rose Library Director Rosemary Magee for a Creativity Conversation on Wednesday, Feb. 24, he urged her to tell the story of how they agreed to talk. It goes something like this. When Magee asked the president to join her, he responded, "I normally respect your judgment, but me, creativity …"
Magee persisted, and rightly so. As she notes, "When I first approached the president, he was thinking of creativity more in the arena of arts and literature." Magee encouraged him to think more broadly, with the result that Wagner — perhaps to his own surprise more than ours — has a rightful claim to being deeply creative. In Magee's words, "It doesn't take too long to see the fascinating ways in which his mind wanders." And so, as the conversation ensued, if Wagner felt a little intimidated being introduced by Theater Emory's Leslie Taylor or spotting poet Kevin Young in the audience, he quickly found his footing. He began by considering the connection between creativity and wonder, asking, "How do we communicate when words aren't enough?" Magee, who has worked with the president for years, observes that "wonder brings him to puzzling things, and that becomes a rich space, involving everything from how cars are put together to organizational puzzles, like Emory. And then there are the galaxies." On his own time, one site of wonder for Wagner is deep space. He is a talented astrophotographer and, unlike that long-ago pioneer Louis Daguerre — who in 1839 just wanted to get the first shot of the moon — the president's interest is "in things way out in space, not obvious to the eye." Among those things are nebulae. Named after the Latin word for "cloud," nebulae have a prosaic side, being massive clouds of dust, hydrogen and helium, and plasma. Yet they have a wondrous side too, being "stellar nurseries" — in other words, the birthplace of stars. But, as Wagner talked about these bodies, he cautioned against ever fully trusting what one is seeing, for nebulae also are the graveyards of collapsed stars. Add to this complexity the sheer, stupefying distance between stars, such that science dispenses with puny earthly miles and instead uses light years — the six trillion miles that a beam of light travels in one year. Proxima Centauri, for example, Earth's nearest star, is 24,000,000,000,000 miles away but only four light years. As the president talked about space, the audience was treated to aspects of his mind that he holds in impressive balance: the awe that flows over into a spiritual dimension and great command of the facts associated with the history of science. "The immensity of space," Wagner said, "means that we can't know what is happening in our universe. As an example, many stars that we are looking at now have exploded and already gone away." He continued, "This is what fascinates me about looking up. It gives me a sense of what I cannot know. In that sense, it is very humbling." He went on to invoke Heisenberg's Uncertainty Principle. As he explained, "You can either know where an electron is or know its velocity, but you can't know both, which tells us that there is hard evidence in the world, but you can't always have it." The lesson of the stars is that we "should be skeptical of our very human tendency to fill in the blanks." One reason for being so is that we often fill in those blanks with biases. Much better, Wagner advised, is to resist the drive for certainty, though he acknowledged that it is hard to do and he struggles with it. Take dark matter, which may account for 80 percent of the universe yet is knowable only by its gravitational effects. That is a perfect example of why, as Magee states, "the president is open to the 'somethingness' of nothingness." In his remarks, he pointed out that the origin of the word "planet" ties to the notion of wandering. Magee sees a natural coextension between the wonder Wagner has for the universe and the wonder that he brings to his work at the University. Both realms have encouraged in him pursuit of knowledge, scholarship and abiding curiosity. "All these things come together in his life and work," Magee notes. "That is why we appreciated hearing from him at such a personal and deep level." Returning to terra firma from deep space, the president talked about his forays into metalworking; in the process, he revealed a knowledge of metals' properties not unlike that of a painter with regard to pigments. With eyes closed, Wagner said, he would be able to differentiate metals based on how quickly they transferred heat from his fingers. He also builds clocks and, clearly playing to the crowd, drew laughs when he vowed that he was working on a clock that would be paired with a bicycle. Cars, as many in the audience already knew, are a huge interest, even avocation, of this president. His 1920 Model T, of course, has been captured in a number of campus shots over the years as Wagner has chauffeured students, and even Dooley, to campus events. His latest car chapter involved buying a 1950 MG from a staff member in Campus Services. It arrived in hundreds of pieces and took six years to complete. Wagner wasn't quite ready to call restoration work creative, though many listeners, including Magee, differed. He does the work, he says, because he loves "discovering the ingenuity of the engineers." His musings about cars also reveal an appreciation of history, for the president was fully versed in both cars' past — the Model T's use in bouncing down horse paths, while the MG wound along narrow British back roads. He assured the audience that he never takes the MG out on Atlanta's highways, where it could not compete. That led him to consider the cruising speed of things without wheels, such as universities. Although faculty and students, especially at Emory, are speeding objects to be reckoned with, universities as an institution are "being tugged along" in part because they aren't "all that good about describing the value of what they do." Wagner urged that, "to nurture creativity, we have to resist defining the idea of a university narrowly," one example of which would be resisting those who call upon higher education to define its primary mission as being to find jobs for graduates. In his view, we have to find better ways to describe our value. As the conversation turned for home, Wagner reflected on his own identity both as an engineer and outgoing university president. Engineers often are characterized as problem solvers, and although that association is undoubtedly well meaning, "To be only a problem solver is to diminish what it means to be human," he said. He recognizes as well, he said, that personal friendships necessarily have taken a backseat to professional ones in the past 13 years and that now he and his wife, Debbie, have resolved that key words in their future will be "friends and family." Magee sees all that in his future and still more, saying, "He is a natural-born teacher, and that spark will always glow. He observes and knows with uncommon precision, yet he understands that much is unfathomable. He acknowledges the limits to knowing at the same time as he commits to doing all that he personally can, and all that Emory can, to know. "Without a doubt," she concluded, "he has some great essays yet to write on these and other meaningful topics." The Wagners leave Emory in August for a new home they built in Hilton Head, South Carolina. The president has — as a first order of, if you will, leisure-time business‚ getting to know the sky there, which will be different. "In Atlanta," Wagner said, "the sky has a red glow. There, it is more black. At the new house, the naked eye sees the Milky Way." For the Emory community, which for so long has counted on this president's energy and optimism, it will not seem out of the ordinary to learn that, once he leaves here, he still will be looking up.